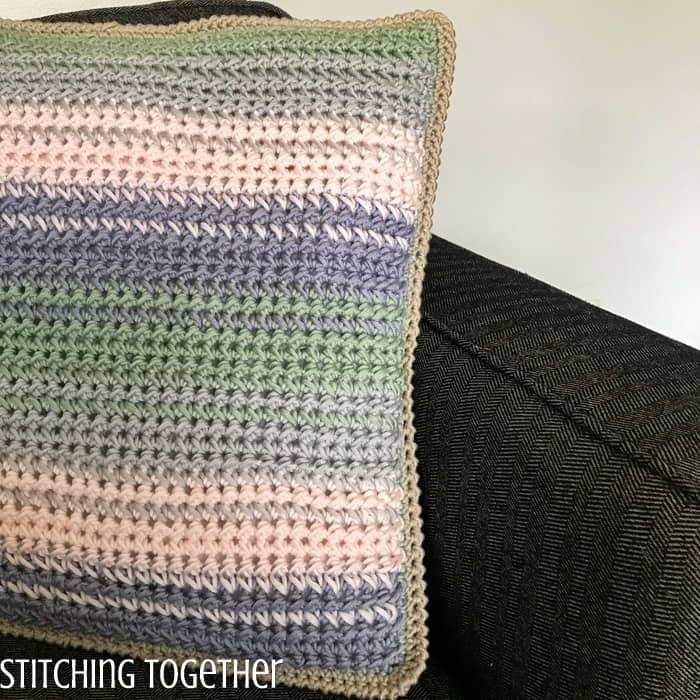 A beautiful crochet throw pillow pattern inspired by the soft spring blooms we long for each winter! Enjoy the free pattern you can find below or purchase a printable version for a small fee. Don’t you just love the first hints of spring? Birds start chirping, trees bud, and here, in Minnesota, we actually start to see the sun regularly. It’s just a wonderful season of fresh beginnings! 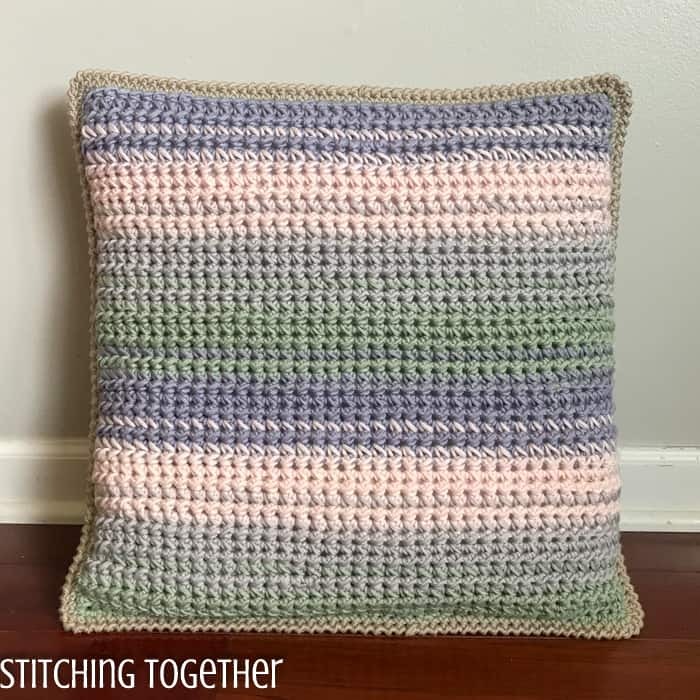 The colors in this pillow are perfect for adding a little spring to your space! They aren’t too bright but will surely brighten up your space. 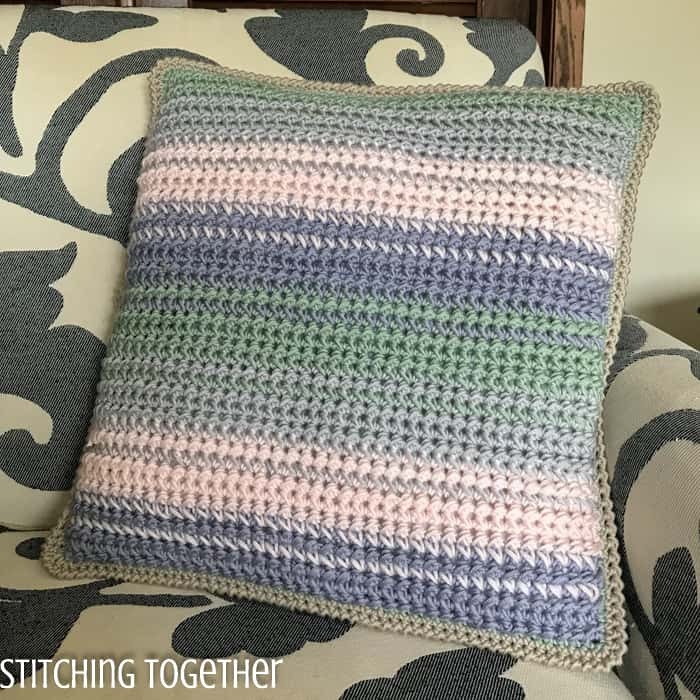 There are quite a few notes and stitch instructions to cover for this throw pillow pattern so please be sure to read them before getting started on the pattern. 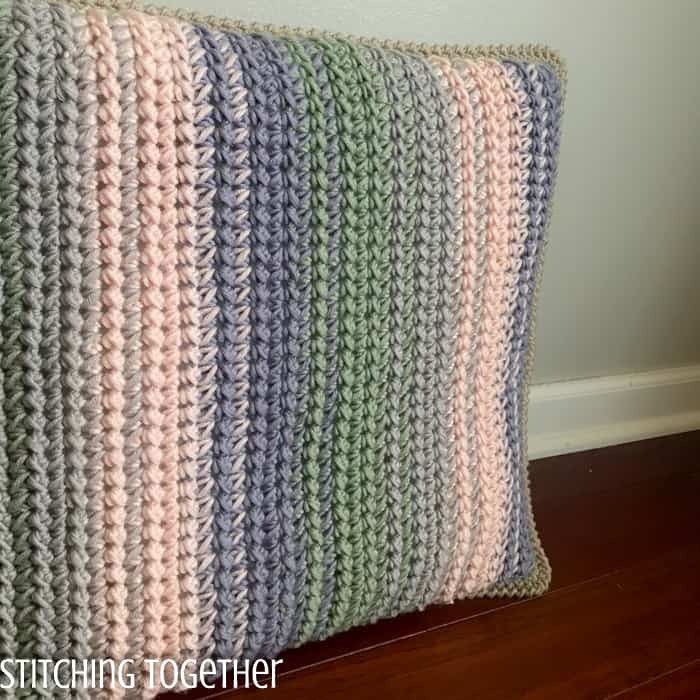 What about the yarn for the Spring Blooms Crochet Throw Pillow? To get this absolute gorgeous blending of colors I used Caron x Pantone yarn, which is such a fun yarn concept! You get five coordinating colors all perfectly matched so you don’t even have to think about it. The yarn itself it a merino blend (20% Merino, 20% Nylon, and 60% Acrylic) which is soft and easy to work with. 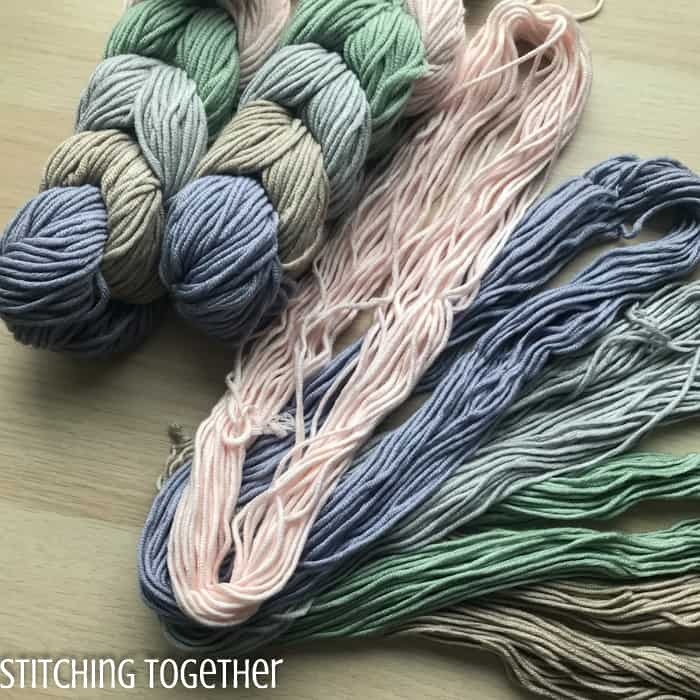 It is probably one of the thinnest, category 5 bulky yarns that I have ever used, so keep that in mind if you are looking to use a different yarn. In each braid (each grouping of 5 mini skeins) you get 3.5 ounces total of yarn, which is 0.7 ounces per mini skein. That’s PERFECT for a small project! Think hats or mittens. But every time I design a new pillow cover, especially if it is has been awhile since the last one, I manage to forget they aren’t really small projects. Combine that fact with the fact that the modified half double crochet takes more yarn than a normal hdc, and you have a project that take significantly more yarn than what is in those mini skeins. I found the regular Pantone yarn on clearance at Michaels as they are clearing it out to bring in the new Pantone Bamboo line which made using this yarn a more affordable option for me. If you don’t want to deal with all the color changes from the mini skeins (not to mention that at least 1 mini skein in each braid had a knot in it too) or the price, using regular full size skeins of another yarn like Red Heart Soft or Vanna’s Choice would probably be easier! Sample used 3 braids of Caron x Pantone in Whistfully and 2 braids in Mushroom Greige. The ch 1 to start each row is NOT counted as a stitch. 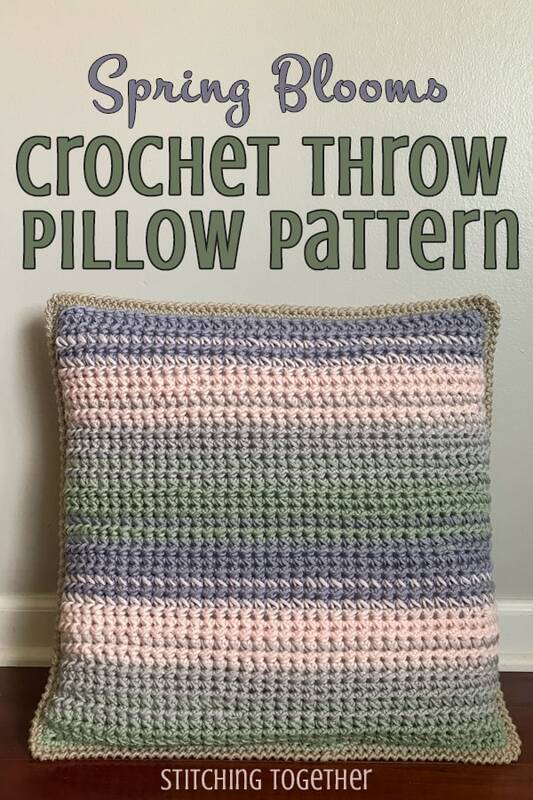 The crochet pillow cover is worked in three different parts. The front panel is done in one piece using the modified half double crochet and multiple colors. Once the front panel is completed, a simple sc border is added around the entire edge which makes it easier to join to the back panels. The back side is done in two different panels, which overlap to allow an opening to remove the pillow from the cover. Both back panels are done in half double crochet in a solid color. The panels are overlapped and then joined by single crocheting around the entire edge. Once both sides are done, they are placed on top of each other with the right sides facing out then joined by single crocheting them together. Using stitch markers to hold the panels in place, first the two back panels and then the front and back sides, while adding the single crochet border helps to keep them correctly aligned. Finally a crab stitch border is added to finish it off. Both the front and back sides should be approximately 18″ x 18″ before adding the borders to ensure a snug fit around a 20″ by 20″ pillow. Modified half double crochet: insert hook into the same stitch of the last completed stitch, pull up a loop, yo and insert hook into the next stitch pull up a loop, yo and pull through all four loops on the hook. See the Striped hdc dishcloth for pictures of how to crochet the modified half double crochet. Modified half double crochet while pulling a different color: insert hook into the same stitch of the last completed stitch, pull up a loop of the contrasting color, yo with the main color and insert hook into the next stitch pull up a loop, yo and pull through all four loops on the hook. Crochet over the working end of the contrasting color as you complete the stitch. Border: Overlap the 2 panels so the entire length of the overlapping panels is approximately 18″. Ch 1, sc around the entire edge of the back side placing a sc, ch 1, sc in each corner, join with a sl st to the first sc. Round 1: Place the front side and back side together with the right sides facing out. Join C5 through both sides, ch 1 and sc around the entire edge through both sides, join with a sl st to the first sc. Round 2: ch 1, reverse sc (crab stitch) in each st, join with sl st to the first st of the round.